A more gentle alternative to our white water river tubing designed for families with younger children. 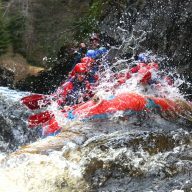 Running rapids and floating down a beautiful clear mountain river on the specially designed river tubes. 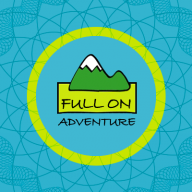 Expert guides and lots of great gear ensures everyone has a safe and fun trip. 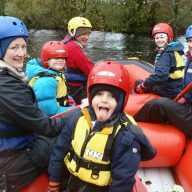 Our River Tubing is designed for families or those wanting the excitement of our Adventure ‘White Water’ Tubing activity but with younger children or just a gentler experience in mind. 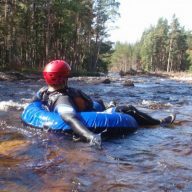 We still use the same great venues as on our ‘adventure white water river tubing’, we just take things a little slower and have easier options on all the sections of the run. In our experience smaller kids love rapids even more than adults, and are usually better at it! We get loads of feedback from people saying this is so much fun it’s the best thing they have done on their holidays, and they come back year after year. 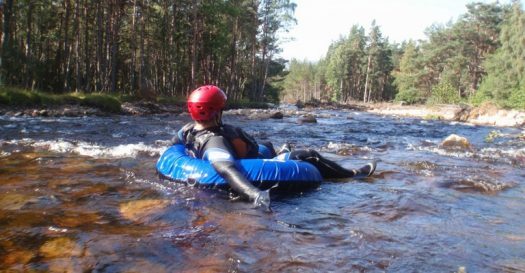 You’ll experience stunning mountain views of the Cairngorms, having a chance to spot local wildlife before running the fun natural water shoots and rapids as the river descents through it’s forested highland glen. Is river tubing available all year? We don’t normally run the activity in the winter months November to end of March and then April is weather dependent. May to end Oct is the main season. We do have the best rivers in Scotland for River tubing and White Water Adventure Tubing. Whats the difference between Adventure Tubing and River Tubing? It’s the same venues we just take it at a slower pace on the ‘river tubing’ activity to allow for younger children and adults wanting a easier experience. Take your time walking up to the top of the river, always have easier options for bits that look too exciting for you, although generally that’s not the kids who want the easier option. Both activities have the option to included at no extra cost pool jumping but obviously on the easier version there are some nice easy step off jumps that are not scary and easy for first timers. But if you want to do cliff jumping from higher you still can on the river tubing activity. Note we only use safe cliff and pool jumps that have been checked carefully to ensure they are deep and safe to jump into and we only do it with the best safety equipment on. ‘Adventure River Tubing’ is our maximum White Water and high excitment version of the activity, more exciting than White Water Rafting and although completely unique it could be described as a cross between Canyoning and WW Rafting. 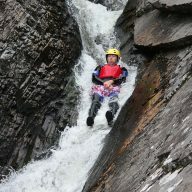 Aimed at Adults or adventurous families (12yrs+) we walk up to the top of the Rapids quickly and get on with an amazing White Water high excitment activity, you can repeat the best bits and so you’ll run the rapids more times than on our easier version of this activity. The adventure tubing takes place in the afternoon to allow it to run longer giving you approximately 30mins extra at the venue, but note whilst every session is excellent in terms of fun, the time taken can vary based on water levels and other group factors. There is a price difference between River Tubing and Adventure River Tubing. How close are you to Aviemore? We are located 5 minutes from Aviemore, and the rivers we use are less than 10 minutes drive from our changing rooms. Booking is essential. Occasionally last minute spaces can be found. Head to toe wetsuit warmth.